Fully furnished cedar timber frame cabins. Available for Short- term rentals and extended stays. All Utilites, Heat and A/C included. Free WI-FI available in all Cottages and Main Office. 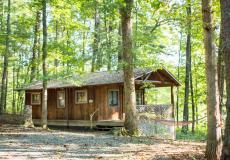 The well-stocked cabins have fully equipped kitchenettes with modern appliances including a microwave. The living room is furnished with a locally handcrafted dinner table, double sized futon and gas propane heater. The spacious bedroom features an organic, locally made queen size bed from Savvy Sleeper. A bathroom with a full tub and shower. All dishes, utensils, linens and towels are provided. along with complimentary shade grown organic coffee, teas and spices. Books, games, CD/radio, Flat Screen TV w/ DVD player and charcoal grill are provided. Front porch overlooks the lake. 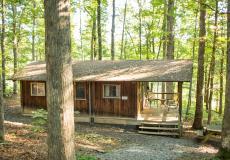 129 acres to explore with a lake, 2 fishing ponds, hiking trails, Canoe and mountain bikes are available for guest use. Pet Friendly, please bring a leash. 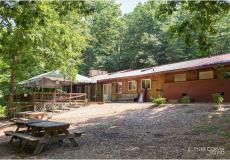 30 minute drive from UVA and Charlottesville, 15 minute drive from Crozet. Just ten minutes from the Sugar Hollow Shenandoah National Park Entrance and the Moorman's River.